Released: 1990. Genre: Scrolling beat 'em up. Let me tell you a horror story. Once, an innocent 13 year old boy wandered into his favourite video arcade and noticed a brand new machine standing menacingly in the corner. Walking past his present favourite Golden Axe, he approaches this new machine cautiously, as the blood motifs and hideous monsters depicted on its shell sent dread down his body. It was like nothing he had ever seen before. He played the game, mesmerised by the gruesome sights and shocking sounds, and like any good tale of horror, this game stayed with him for the rest of his life. That boy was me. Splatterhouse left a mark on my psyche that would prepare me for all further horrifying games thereafter. Arguably, this is the game that showed the world that gaming’s horror genre had been born, and would eventually spawn the likes of Resident Evil and Manhunt. 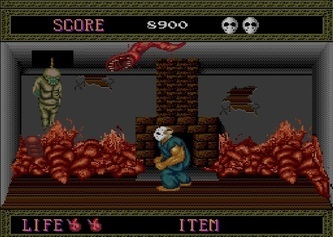 Splatterhouse is in all respects a very basic scrolling beat ‘em up, with a tacked-on storyline and ideas plagiarised from the various horror films of the 1980s. It’s solely in a 2D environment, with few platforms to speak of and in a very linear style. Beat ‘em ups such as P.O.W and Double Dragon had much more depth, but its originality does not lie within its gameplay as such, but for the shock-factor of its visuals and sounds. Mutilated human bodies, enemy monsters sliced in half, chilling screams and disgusting flesh-ripping SFX gave it the ‘X’ factor. This was something not seen so vividly in a video game before. Released as a coin-op in 1988, it made quite an impact in the arcade teenage community and thus became a cult hit. 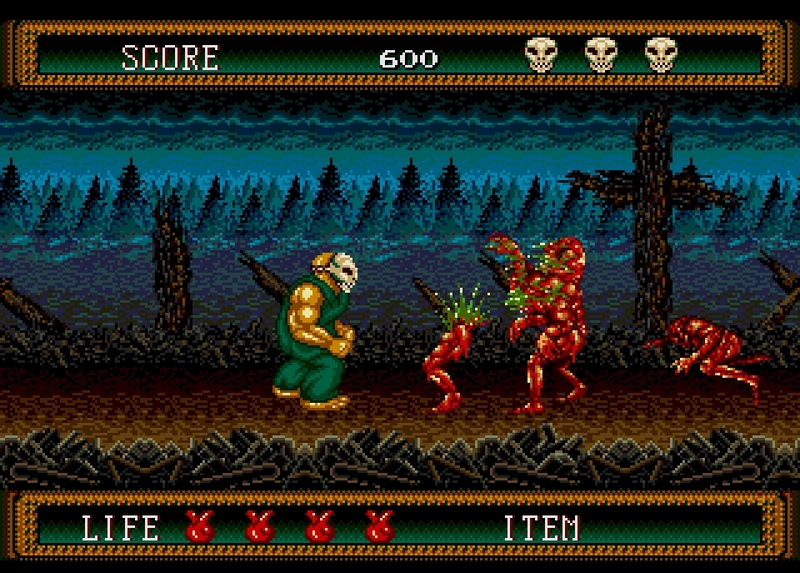 It didn’t make the transition to the more popular formats, but was ported to the equally cultish TurboGrafx-16 in 1990. 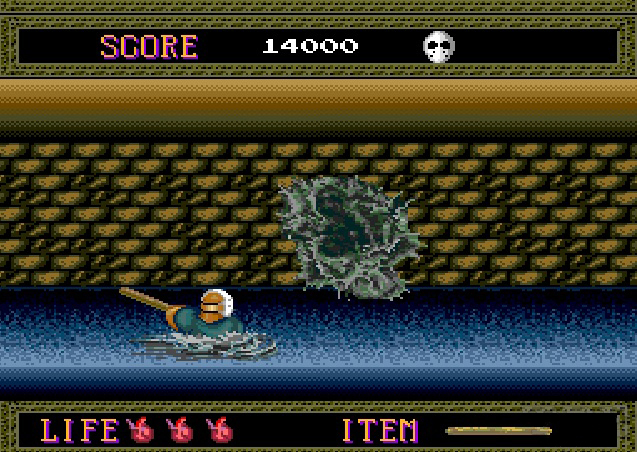 As was the practice at the time, the western TG16 version was censored slightly from the original arcade, but still contained enough shock value to cross successfully to home console. 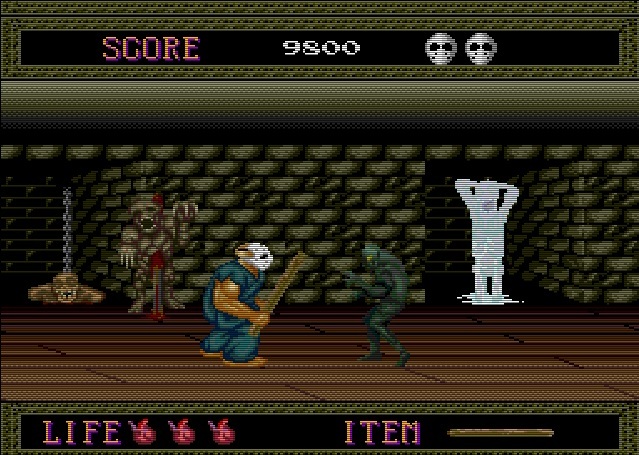 These were the days before the ESRB, and the graphic violence Splatterhouse contained seemed to go largely unnoticed. 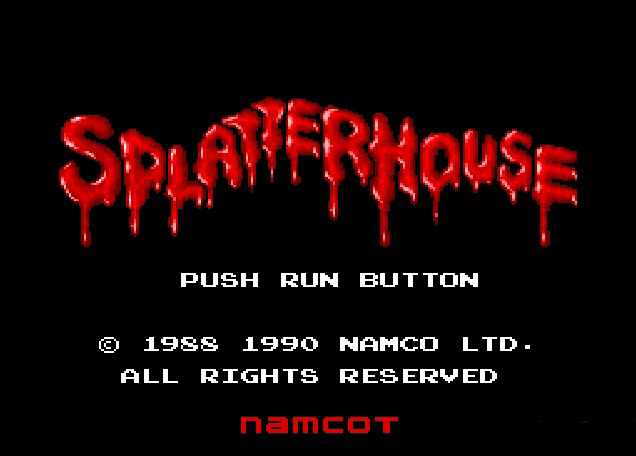 Censorship rules on games changed years later of course with the likes of Mortal Kombat, Doom and Grand Theft Auto 3, but I’m certain Splatterhouse raised a few concerned eyebrows. The concept is simple. You play Rick, a student who takes shelter from a thunderstorm with his girlfriend (as you do!) in a creepy mansion locally known as the ‘Splatterhouse’. What could go wrong? To cut a long story short, your mission as Rick is too traverse the house, tearing everything and everyone to bits as you go in search for your beloved squeeze. Oh, and also Rick has been possessed by an evil mask, made to look remarkably like Jason Voorhees from Friday the 13th, and made him super strong. The game itself doesn’t divulge much of this information however, you find out as you travel though the game. Predictable story aside, the actual gameplay is pretty straightforward and maybe a little dull. It’s really just a case of walking and hitting lots of things, and many more things, over and over. Classic beat ‘em up in the simplest form, but both the gruesome environment and the way Rick can dispatch the numerous creatures adds scope, amusement, and grossness to the proceedings. Meat cleaver chopping, squished creatures with a stick and heads blown off by a shotgun, it’s all there. The graphics are at the heart of all this, and while there’s a little less blood and guts flying around the place, the TurboGrafx-16 port is very faithful to the arcade original. The speed and sequences of the game are mostly unchanged, just with less detail on some of the gorier corridors. Some still images are missing and a couple of the bosses have been altered. I can understand the mid-level still images, these were some pretty nasty pictures. In direct comparison to the sharpness and detail of the arcade original, the TG16 matches things up very accurately and is rather impressive to boot. So despite the watered-down horrors, it’s all still quite wince-inducing to the eyes. Essentially the visuals make this game, so Namco did a fine job in transferring the primary hook in all its gory beauty. One thing the console version fails to replicate however is the chilling soundtrack and SFX of the original. The arcade had a typical horror BGM which gave the chills even more bite, and the overlaying SFX proved the icing on the cake. 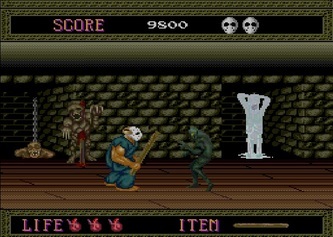 Horrible sounds of flesh slicing, guts splatting, moans, screams and cries of terror were awesome, but the TurboGrafx-16 cannot fully replicate them. It’s all a bit tinny in places, flat and muffled in others, and at some points the familiar bleeps of the 8-bit heyday make an unwelcome appearance, reminding us that the console is really an 8-bit with sparkles. The sound of the bloodworms is particularly rubbish compared to the arcade, and the high screams of Jennifer in peril are missing completely. All this does take some fun out of the game, as the blood-curdling graphics just don’t seem to pair correctly with the reduced sound quality. 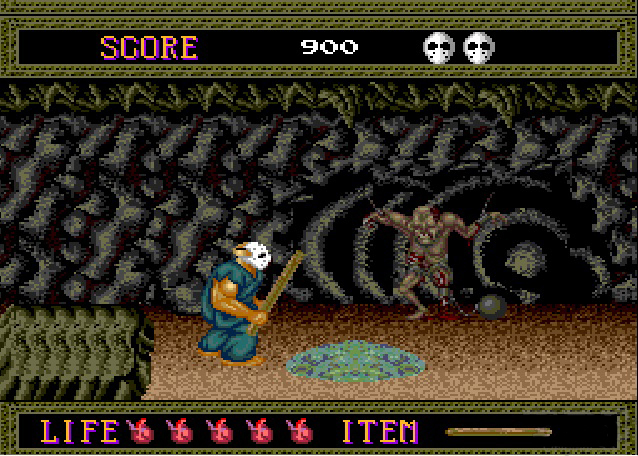 Taking all the buckets of claret, sinew and bodily fluids into consideration, Splatterhouse made the conversion to home console in a first-rate fashion given the limitations of the platform. The important scare factor remains intact, and the storyline, while being a humdrum affair, is presented and told well enough. Spotting the many references to the classic bygone horror films is a nice little aside to the game too. The Texas Chainsaw Massacre, Poltergeist, Night of the Living Dead and of course Friday the 13th have all been heavy influences. 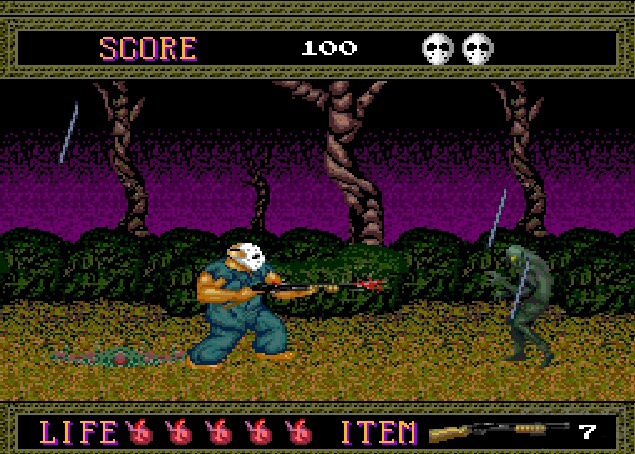 Add to that the originality of the impaled bodies in the backgrounds, the howling water zombies and the impressively gruesome bag-headed boss with chainsaws for hands, the frights are constant, nasty and surprising for a game released in 1988. This is all entertaining stuff, but separate the actual playing from the sights and things are not all fantastic. It’s not that hard to complete, and the limits on movements and the lack of variety make it repetitive and dull after the novelty of the blood has worn off. 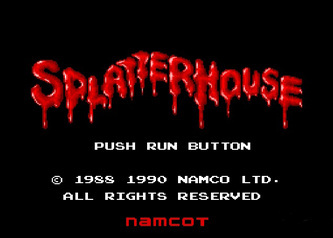 I like to play it now as a reminder of the simple outrageous fun that can be had chopping zombie heads off or watching their guts dribble off the walls, an aspect that many horror games would imitate and evolve to even more gruesome levels. 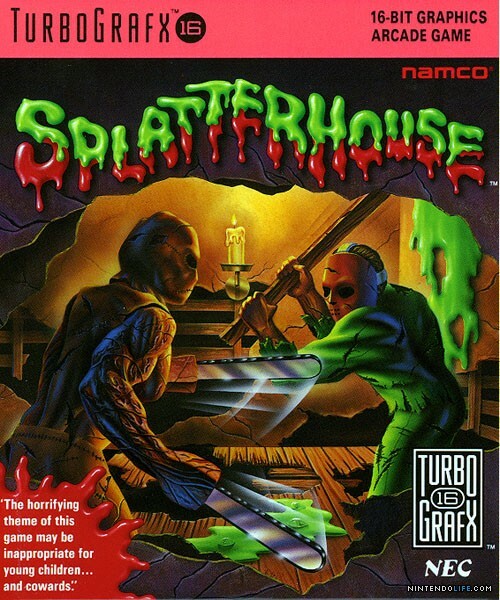 Splatterhouse was the forerunner however, and should be remembered for what it gave to the adult gaming market. It’s a classic for those reasons alone.